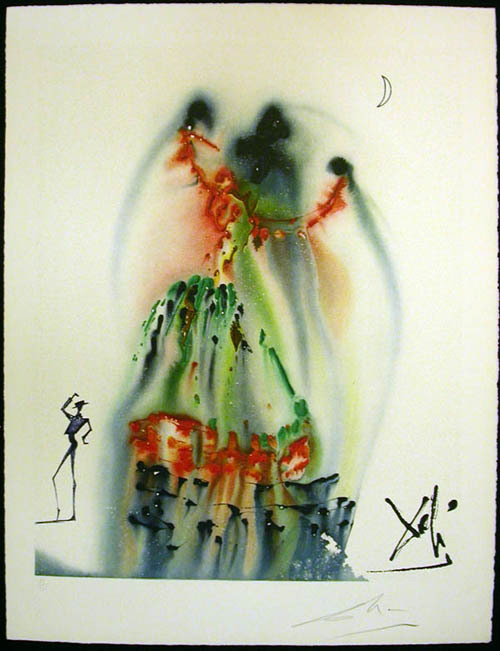 Salvador Dali The Habenera is a single print. It is part of the Carmen suite. The suite is rare. The suite contains 25 lithographs based on the Carmen opera. This suite consists of 25 lithographs. Shorewood Publishers, New York published the book. Dali signed each lithograph in the lower right. The lithograph has a number in the lower left. This number is the tirage number. This lithograph is sold. The lithograph is authentic. Finally, go to the main Carmen Page for complete information regarding the suite.